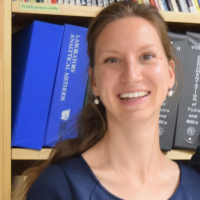 Dr. Esther Maas is working as a postdoctoral research fellow at the Partnership for Work, Health, and Safety, which is a partnership between WorkSafeBC and UBC. She is supported by a CIHR fellowship, and is working on a program of research on the evaluation of workers’ compensation policies and programs, with a particular focus on identifying effective and cost-effective approaches in facilitating early and sustained return-to-work after a musculoskeletal injury. Dr. Maas earned a Master’s degree (with honors) in Health Sciences from the University of Maastricht, and a Master’s degree in Epidemiology from the VU University in Amsterdam, both in the Netherlands. She completed her doctoral research at the VU University in the field of Health Sciences, in which she mainly focused on the cost-effectiveness of radiofrequency denervation for chronic low back pain. Her primary research interests include health technology assessment, economic evaluations, and epidemiology, and musculoskeletal health.